As I explained in the above post, I now use 10% alum sulphate without cream of tartar for mordanting wool. (i.e. 10gms alum – or 2 rounded teaspoons- per 100gms wool.) As I find it easier to measure out liquids rather than powders, I usually make a solution of 100gms alum dissolved in one litre (1000mls) water. At this dilution, 10% means I use the same quantity of alum solution in mls as the wool weighs in gms. (i.e. to mordant 500gms of wool I need 500mls of alum solution). To save time later, I tend to make several litres of alum solution at once, as any remaining solution can be stored indefinitely for use at a later date. (See note below for storage advice) The crucial thing to remember when making the alum solution is to make sure that all the alum has dissolved completely. I find it best to add the boiling water gradually, stirring well as I proceed. When I want to use the solution I always shake the bottle well first, just in case some alum has sunk to the bottom. I have done tests with most dyestuffs and can see little, if any, difference in the depth of colour achieved on wool using a 10% alum mordant, when compared with the results achieved from the same dyebath using wool mordanted with a higher percentage of alum. As one of my aims as a dyer is to reduce as far as possible the quantity of chemicals used, without compromising the quality of the results, I can see no point in using a higher percentage of any chemical than is necessary for good results. However, I would also add that each dyer will tend to have his or her preferred mordanting methods and whatever gives the desired results, without causing harm to humans or the environment, is the best method for the individual dyer in question. Indeed, the number of different alum mordanting recipes available is remarkable and must be bewildering for a beginner. Dyeing books written in the early to middle 20th century tend to advocate the use of a higher percentage of alum than is necessary or desirable, often as much as 30%, but in more recent books the percentages recommended tend to be lower. In today’s environmentally- and safety-conscious world, where dyers have recognised the need to use the smallest quantities of chemicals possible, the abundance of different alum mordanting recipes available would seem to indicate that more people are experimenting to find the recipes that best suit their individual needs. I don’t work with silk very often, although I do sometimes mordant and dye silk skeins for a friend who is a silk weaver. My preferred mordant for silk is now 5% alum acetate. In Japan, alum acetate is widely used as a mordant for silk and I find this recipe gives excellent results, although the 10% alum sulphate recipe I use for wool is also effective. For vegetable fibres I also use 5% alum acetate, as this is so much simpler than the alum/tannin/alum method I used in the past and gives excellent results. To return to today’s mordanting: After stirring 600mls alum solution into the water in the pot, I added 600gms of well wetted wool. I started off by raising the heat gradually then simmered the wool in the alum solution for about 45 minutes. Unfortunately, the pot was rather full & the lid doesn’t fit very well, so the mordant bath overflowed during the simmering process and left my work surface swimming in water. After mopping up the liquid and squeezing as much as possible back into the pot, I then turned off the heat and left the skeins to steep overnight. I then removed them, squeezed the excess liquid back into the pot and dried all the skeins except those I want to dye in the next few days. These I left damp in a plastic bag, so I wouldn’t need to wet them out again. I then added a further 600mls alum solution to the used mordant bath and added a further 600gms of wool. In order to avoid flooding my work surface again, this time I gradually raised the temperature to simmering point, keeping a close watch on the pot all the time, then immediately turned off the heat. I left this batch of yarns to steep in the mordant solution for about 36 hours, moving the yarns around gently from time to time. It doesn’t really matter which method one uses, as both are equally successful. In fact, it’s also possible to apply an alum mordant to wool fibres without heating the solution at all, as long as the fibres are allowed to steep in the cool solution for 3 to 4 weeks and are moved around in the pot regularly. However, when mordanting wool, I prefer to apply heat, at least to start with, mainly because wool tends to absorb liquids better with heat and I feel the results are therefore likely to be more reliable. This is also why a hot indigo dye vat is recommended for wool, whereas cotton, linen and other vegetable fibres can be successfully dyed in a cool vat. However, if wool is left for a longer period in a cool vat, it will gradually absorb the colour. Silk, whilst technically an animal fibre, seems to fall between the two fibre categories and tends to react equally well in both hot and cool vats. Storage advice: Alum solutions can be stored in glass or strong plastic containers, with well-fitting lids. However, I don’t recommend the rather flimsy opaque plastic milk containers as they may absorb, rather than store, some of the solution. I know that when I used these milk containers to store woad solution, I ended up with dark blue containers & rather less blue pigment for dyeing than I had expected. I use the strong plastic gallon/5 litre containers in which things like cider, apple juice, vinegar, detergent etc are sold & have found these ideal. (My husband tells me he thinks these are actually made from some sort of nylon, which is non-absorbent.) Otherwise, the clear strong plastic bottles in which water & juices are sold are also suitable. Containers for household bleach would also be OK, as long as they are thoroughly washed out first, and they have the added advantage of child-proof tops. Large glass bottles which contained pickled onions, gherkins etc would also be fine & if the neck is too wide, I use a funnel to make pouring easier. As long as the containers are well washed out, it doesn’t really matter if they still smell of whatever they contained, as any aroma is unlikely to be transferred to the materials being treated in whatever solution was stored inside them. I usually store all my solutions in a brick-built outbuilding, which doesn’t get much natural light. In general, store solutions in a cool place, away from direct light & make sure they are clearly labelled, preferably in indelible pen. For extra security I usually fasten a plastic label round the neck, as I’ve found that snails tend to make their way into the outbuilding and sometimes eat away at my paper labels. What do I do with all my dyed samples? This is a question I am frequently asked and I’m afraid that the majority of my samples remain in cupboards until required for talks or displays. Some of them are fixed into sample books, of course, or made into display boards. But believe me, I really do have a large amount of dyed yarns, so when I can no longer find space for them all, I take some of them to the knitting workshops I occasionally lead and invite students to help themselves. It is a real pleasure to tip out the contents of bags and boxes onto the table and watch as students select the colours they find most to their taste. When I do get round to using my dyed yarns, I like to design my own knitwear & chart my own multi-coloured patterns, sometimes for cushions or bags and sometimes for jackets. However, complicated patterns are usually for jacket borders and cuffs only, as I rarely have the patience to knit an entire garment in charted, stranded knitting. 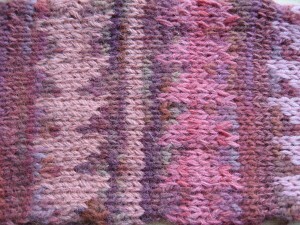 However, I plan to knit a jacket using only colours from mushrooms and I have been experimenting with colour designs. This is part of a sample knitted from a design I charted using colours from Cortinarius semisanguineus achieved on alum-mordanted wool. This is the design I plan to use as an all-over pattern for my next jacket. This is a close-up of a section of the design above. 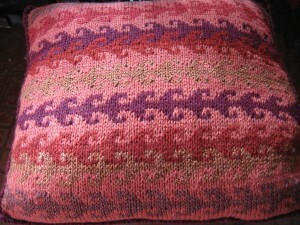 This cushion was knitted using only yarns dyed with madder. 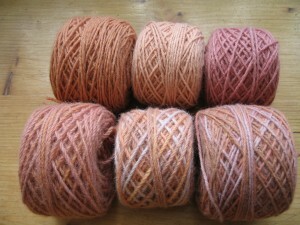 Some of the skeins have been modified for colour variations. The purple shade was achieved using an iron mordant followed by a washing soda modifier. The recipe is in my latest book “Colours from Nature”. For more details click on “My Books” on the home page. 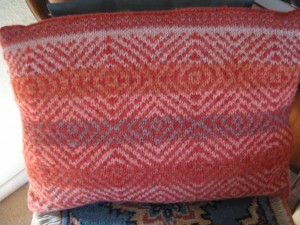 This is another cushion knitted using only yarns dyed with madder. The patterns on both cushions are traditional Turkish sock designs. 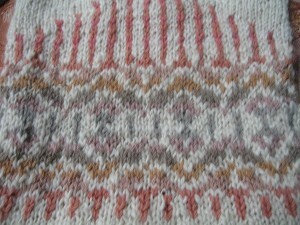 This one uses a typical Turkish sock technique of working the pattern design itself in the same colour throughout and changing the background colour. This week I took delivery of a beautiful book, “Mushrooms for Dyes, Paper, Pigments & Myco-Stix” by Miriam Rice, with illustrations by Dorothy Beebee. Miriam Rice is the acknowledged authority on the subject of mushroom dyes and I ordered the book in the hope of extending my knowledge and understanding of dye-producing fungi. The book is a treasure trove of information, with lovely colour photos and wonderful drawings by Dorothy Beebee. It will certainly inspire me to continue to search for fungi to use in the dyepot. The Last of the Fungi? My own searches for fungi haven’t proved very fruitful as far as dyebaths are concerned but, thanks again to Leena, I still had some stalks of Cortinarius semisanguineus waiting to be used and recently I managed to get round to using them. 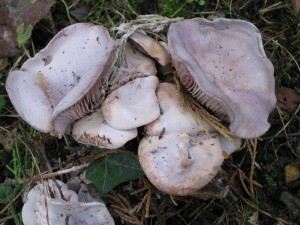 The earlier samples of colours from Cortinarius semisanguineus were from the caps only and I had been told that the colours from the stalks were usually more orange in tone. I know from past experience that different parts of the same plant may give different shades, so it’s often a good idea to separate flowers, leaves and stems when testing plants for the first time and prepare a different dyebath for each. It therefore came as no surprise to me that the same holds true for fungi. This image shows a range of shades from the stalks. 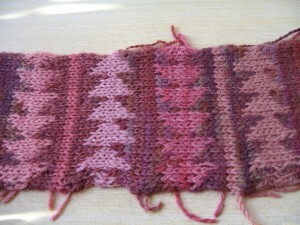 The two skeins on the left are unmordanted and the other skeins are mordanted with alum. The unmordanted samples are pretty, reasonably rich shades but they will probably be less fast to light & washing than those mordanted with alum. Time will tell. The skeins are now in balls, making it easier to identify them. In these experiments, a relatively small amount of dyestuff seemed to go a long way. I had 60gms of mushroom stalks and managed to dye a total of about 250gms of wool the shades shown above. I simmered the stalks for about 2 hours then strained off the dye liquid for the dyebath. I then simmered the stalks again to extract every last bit of colour and added that to the dyebath. I dyed the single-coloured skeins first and modified two of them as above. I then dyed the two variegated skeins. 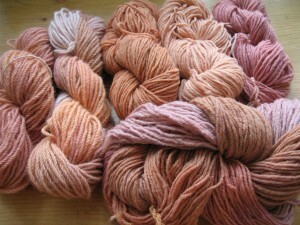 To do this, I first dyed the skeins in the dyebath then removed them and gently squeezed out some of the excess dye. I then added modifiers to the end sections of each skein as follows: I dipped one end of each skein in a solution of washing soda and the other end of each skein in an iron solution, leaving the centre section unmodified. I left the skeins to soak in each modifier until there was a clear variation of shades on each skein, then removed them & rinsed them very carefully so there was no iron contamination. Note: When modifying sections of skeins, rather than the whole skein, it is important to make sure the areas to remain unmodified do not hang below the sections being modified, otherwise the modifer will leech into the rest of the skein. I used to tie the skein to a hook screwed into a beam above the work surface where I have my heat source. However, since my workroom has been re-roofed this beam is no longer available, so I now put a weighted saucepan on top of some bricks & fasten the skein to the handle of the saucepan. Much will depend on the length of the skein but it is often possible to put the two modifier pans next to one another, leaving only a small gap between, and then both ends can be modified simultaneously. This photo shows the shades from a small sample dyebath of, I think, Trametes versicolor. The dyebath appeared very pale in colour so I was surprised to achieve what is a rather attractive cinnamon brown. The sample on the left is unmordanted and the sample on the right is alum-mordanted. Next to the samples are the used pieces from the dyebath. The pieces came from one of the fungi I found on my walks in the woods & which has been identified by several readers as probably Trametes versicolor. Perhaps the dyed samples above will help to confirm this identification? Large amounts of snow are such a rarity in this part of the South-east of England that I have been out with my camera capturing the moments. On Sunday evening we had about 3 inches of snow, followed by more during the last two nights, so there is now a layer of snow about 5 inches deep over the garden and it is still falling gently. Everywhere looks so beautiful. 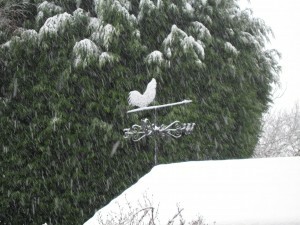 This was taken while the snow was falling and shows the weathercock on the roof of my workshop silhouetted against a conifer tree. This was taken from an upstairs window, also as the snow was falling. 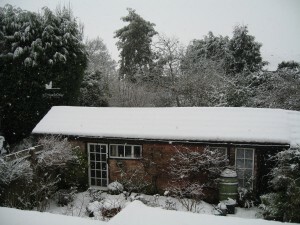 It shows my workshop with the main garden behind. Our large eucalyptus tree is in the background in the centre. In this weather our cat has abandoned her position in the birdhouse, leaving it free for the birds to come and enjoy the food we put out each day. 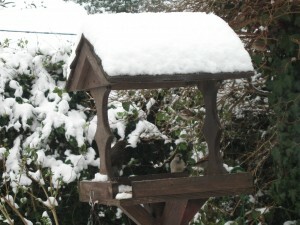 If you look very closely you can see one bird on the bird-table and another in the tree behind, waiting its turn. Following some helpful comments from a mushroom expert, I think I have wrongly identified the second mushroom. As it was not growing on the ground, it is almost certainly not Giant Club Fungus but more likely a polypore, perhaps Polyporus floccipes? Now that I am aware of the potential pleasures of dyeing with fungi, I keep my eyes open for anything in the garden that may be a possible source of dye colour. I’ve been told that the darker the fungus is in colour, the more likely it is to contain useful dye pigments, so I must bear this in mind, as I don’t want to waste time or fungi by collecting indiscriminately. I think this mushroom, found growing under some pine trees, is Russula sardonia and I suspect that it will not be useful in the dyepot. However, as there are two largish clumps of it in the garden, I tested a small quantity and found that my suspicions had been correct. The dyebath produced only a pale beige tone on both alum-mordanted and unmordanted wool. I think this is Giant Club Fungus (Clavariadelphus pistillaris). 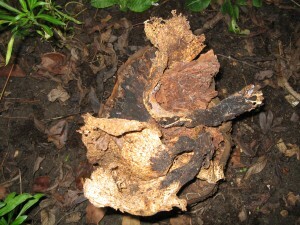 It was growing on the stump of an elm tree in our garden. As it is brown in colour, I thought it might be worth trying it in the dyepot. 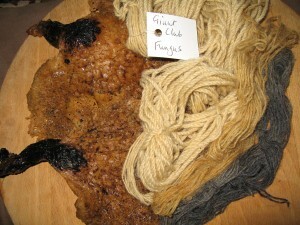 These are the results of the Giant Club Fungus dye tests. Left to right: No mordant. alum mordant, no mordant + iron. Whilst the colours are not remarkable, the grey from the iron modifier is an attractive and useful shade. However, as this shade can easily be obtained from other sources (e.g. 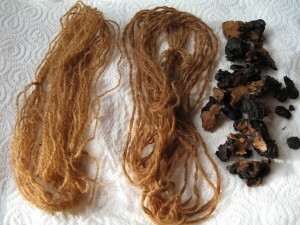 oak galls + iron), I shall probably not be using this fungus again for dyeing.